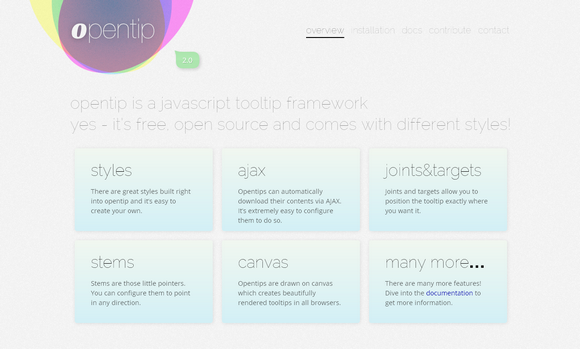 Opentip is a free opensource Java-Script tooltip class. There are great styles built right into opentip and it’s easy to create your own. Opentips can automatically download their contents via AJAX. It’s extremely easy to configure them to do so. Joints and targets allow you to position the tooltip exactly where you want it. Stems are those little pointers. You can configure them to point in any direction. Opentips are drawn on canvas which creates beautifully rendered tooltips in all browsers. Opentip has been developed for and tested in all major browser, including IE7+. I’m implementing different tooltips in my projects.These resources will help me to keep experimenting. Thanks.